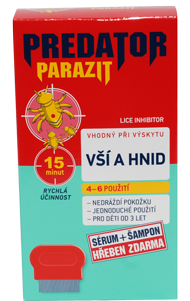 repels, paralyses and kills ticks, mosquitoes, black flies, fleas, flies, ants and other insects. Czech company, Czech owner and athorough Czech formulation. The brand PREDATOR has been here for you ever since 1997. Our focus is on development of a complex working procedure ensuring high quality insecticides and repellents. Our goal is to satisfy the customer demanding protection against troublesome and harmful insects evenin infested areas. State of the art among the modern protective products. New 3D generation of protection against troublesome insects.